The spring element is intended for axial loading, and typically has a minimum of four strain gauges, two in the longitudinal direction, and two oriented transversely to sense the Poisson strain. 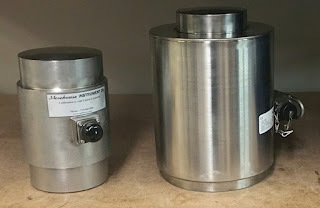 • Physical size and weight - It is not uncommon to have a 1,000,000 LBF column cell weigh less than 100 lbs. • Reputation for inherent non-linearity. This deviation from linear behavior is commonly ascribed to the change in the cross-sectional area of the column (due to Poisson’s ratio), which occurs with deformation under load. 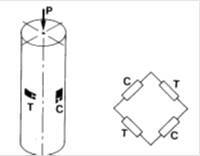 In this type of design, the load is carried by four or more small columns, each with its own complement of strain gauges. The corresponding gauges from all of the columns are connected in a series in the appropriate bridge arms. • Improved discrimination against the effects of off-axis load components. • These cells typically have less creep and have better zero returns than single-column cells. • In many cases, a properly designed shear-web spring element can offer greater output, better linearity, lower hysteresis, and faster response. • Having four columns usually increases the physical weight. 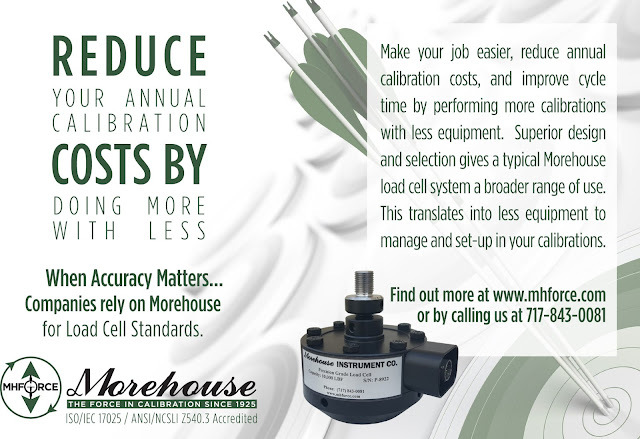 Note: For those needing a portable lightweight cell, Morehouse now has a 27 LB, 600K compact multi-column load cell. The cell has an accuracy of better than 0.02 % of full scale. This type of design is often used in weighing applications. There are four gauges placed inside the beam. 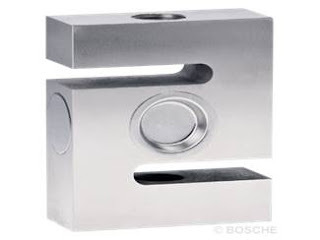 • In general, linearity will be enhanced by minimizing the ratio of deflection (at rated load) to the length of the sensing beam, thus minimizing the change in shape of the element. 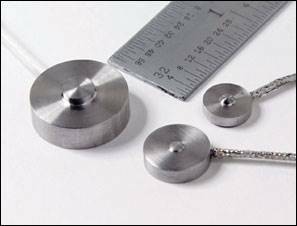 • Ideal for measuring small forces (under 50 LBF) when physical weights cannot be used. 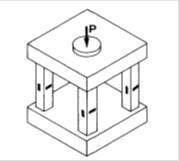 This type of design is often used in weighing applications or when there is minimum room to perform a test. 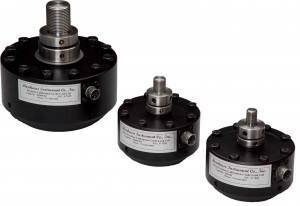 The load cells on the left exhibit high errors from any misalignment. A 0.1 % misalignment can produce a large cosine error. Some of these cells typically have errors anywhere from 1 % - 10 % of rated output. This type of load cell is typically the most accurate when installed on a tapered base with an integral threaded rod installed. • These cells typically have very low creep and are not as sensitive to off-axis loading as the other cells discussed. Video showing only 0.0022 % off axis error can be found here. • These cells would be the recommended choice for force applications from 100 LBF through 100,000 LBF. • After 100,000 LBF, the weight of the cell makes it very difficult to use as a field standard. 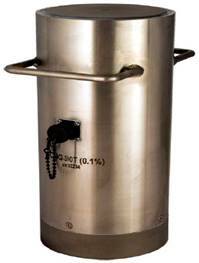 A 100,000 LBF Shear Web cell weighs approximately 57 lbs and a 200,000 LBF shear web cell weighs over 120 lbs. Note: If these cells are used without a base or without an integral top adapter, there may be significant errors associated with various loading conditions. Video showing errors with not having an integral top adapter can be found here.